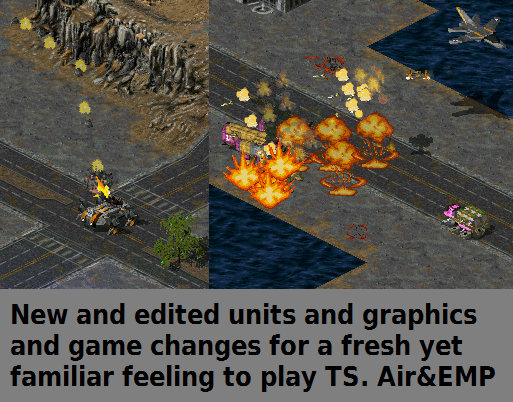 Orange Sun formerly known as Orange Touch Up [OTU] enhances Tiberian Sun Firestorm greatly and increases the gameplay possibilities while remaining the original feel of the game. Basically a re-balancing together with new content and lots of spleen. Now features the Campaign+ modifications. - Techleveling in-game by upgrades. - Heroes that can be trained and are available once. - New Visuals consisting of new Projectiles and new unit look and new Effects, partially new Terrain, new civilians, new loading screens and improved Interface. - Overall rebalanced and reedited, about 80% of the games code has been altered. - Including the unofficial mini patch UMP, the TS Asset expansion and the best the public assets got to offer. - Units becoming more skilled by leveling up, gaining new weapons and abilities. - Nods old artillery that actually hits yet balanced out. 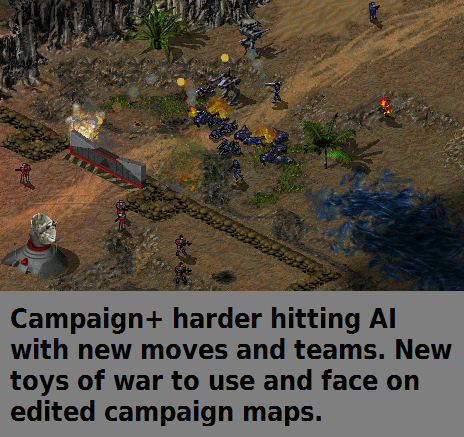 - No paranoia (all AI against you with their superweapons) and maps that feature alliances with an AI player thanks to CnCNet 5. - New maps added, Bay of Pigs and the PPM Massive Map Pack 1.2. - Units with special bonuses and allowing new tactics available by the respective building. - Many new units and a few new buildings. - An AI that is fun to battle against in skirmish, waves of waves of enemy troops coming after you, can you destroy their base before yours fall? - Campaign compatible with edited missions for a fresh campaign experience (not fully done yet). - Optimization and redesign of old gameplay elements such as power, veterancy, repairs, silos, outposts, airforce, and more. Buildings now auto repair and no more silos. All buildings store money now and lose it when blown up. Tibed - Got me into modding C&C, very good for simple mods and holds great potential. TiberFCSL - who gifted me the new menu which looks sweeter than sweet. Also for his advice feedback and general help. Apple - For his advices and efforts. Nolt - for the Ontos and AML that he made for the mod. PPM & Tiberium Web Community - For the knowledge and advice and assets and whatnot. When I find a video on the net about this mod I am adding it here. MP Skirmish with RA2 features alliances and starting positions among others. I don't understand you so here is the link to the new version. You don't need any other. Hi. Is there a way to enable the campaign movies when playing with this mod? Cat-astrophic Hi, yes there is you just need to move the two mix files called movies into the modded game folder and thats it. You can get them by downloading the full game from somewhere. I did not include them since they're over a gigabyte of size making the download painful for people with poor internet. Thanks for the answer! So I have the cds from way back. I tried copying the files but no movies yet. Are those the files: MOVIES01.MIX, MOVIES02.MIX, movies03.mix? Oh and make sure you have a clean mod installation again. So get rid of the files that you copied over from the CD. Your idea is probably not gonna work at all. The mod is based on the freely available The First Decade edition which is similar but not identical to the CDs that you have. I don't even know of movies03. Yeah its a hard one. Laser turrents are the key to victory there. When you build facilities you trigger new attacks so staying a bit low tech until you have solid defenses is important. You may wanna reduce the game speed to make sure that much of your initial force survives by micro managing them. Some bazooka guys should be able to deal with the turret. Btw. watch out when you cross the bridge to the second base. it can be destroyed forcing you to use the hero and other means like air and underground apc to reach it. I didn't wanna announce it since it can take me a while but I am working on more missions. There's a good chance that in a couple weeks or months there's gonna be a new mission addon. Now I'm playing the mission "Destroy Hassans Temple" and I found 2 problems: for some reason I have 800.000 credits and at the end of the mission the game crashes. The money is intentional. I thought it is fun to have unlimited money for once. Well I had much bigger plans for that mission but never got to do it. In sheeps clothing where you fight with GDI units against mutants. Destroy Mammoth MKII the initial force never spawns for god knows what reason. The first few Firestorm missions are also edited and really fun. Ah I see I thought the extra money was some sort of issue. I finished that mission too and the second time no crash. It would be good to fix the missions that cause crash (I just crashed on that wolf on sheeps clothing mission start). I guess I can choose the next mission from the menu if no fix is possile. Yeah you can select the mission there however once you finished it you'll always play mission 2 next. I'll be replacing the mission with something else. Any ideas? I like to take the terrain of the level and wipe it clean of all triggers and scripts and then create my own. If you have something you'd like to see in it, maybe I can do it. Btw in mission 3 of GDI campaign (Firestorm) the game crashes after I neutralize the 4 riot leaders. Thanks for the report. It crashed for me as well and I was able to spot why. Odd I remember playtesting that mission a couple times... Well should be easy to fix. These are the original missions from westwood. When you copy paste them into the main game folder they take effect. So if a level is broken by my edit you can still play the vanilla one. I'm working on it as we write so I guess around the weekend I should have a fix for a couple missions up. Was the second FS GDI mission alright? Thanks for the instructions to fix this! Do you know which number "wolf in sheeps clothing" is? As for the second mission in FS yes its working here no problem. The original mission file wont help you for that mission since I didn't edit it. It is the original that is breaking with the mod. I'm finishing the Firestorm campaign with GDI right now (currently mission 8) and no other crashes so far. I'm working on it and I have news too. The original FS GDI 03 mission works perfectly fine. And since its hilariously easy I was able to finish it in 1 minute and 13 seconds. The fix is to change it out. I saw a youtube playthrough of sheeps in wulfs clothing where the player needed less than 5 minutes to win by sending some orcas over in a suicide run at that one building. I can't really fix that mission I'll have to rebuild it completely apart from basic terrain. I think its a better idea to redesign these missions and upload them when they're done. Skip them, they're not worth playing all that much anyway without an overhaul. This comment may come over as disappointing but I wouldn't take it that way. There's an overhaul for plenty of missions coming and its not gonna take an eternity to do. It would be disappointing to upload a quick fix for 2 missions which are not really all that much worth playing and then still have one that crashes. Its ok bro if you are willing to redesign the missions all the better! I finished the GDI campaign on FS but last mission was just too much x_x so idk if it crashes or not. I started the nod campaign in FS and I'm getting a runtime error in the end of mission 2. Gonna add Nod FS 02 to the list thx for the report mate.